Dreambox decoder is a Linux based satellite receiver that has been widely used to receive both free and encrypted satellite channels from the sky. As you may normally just hook it up to your TV to view the decoded channels on your large TV screen, have you ever wonder that it can also be connected to multiple PCs in your LAN network for viewing on PC screen? With its built in Ethernet controller that can be used for card sharing, it also simplifies connectivity between PC for this purpose. If you interested to figure out more, here are some simple steps that you can try to set them up using VLC player utility. On the Dreambox remote control, go to Menu -> Setup -> Expert Setup -> Communication Setup and read the IP address of the Dreambox. The IP address will be used on next step. On the PC screen, launch Internet Explorer and key in the IP address in the address field. For instance: Type http://192.168.1.5 (following IP address shown in Step ii). Once prompted by password, enter ‘Root’ as User Name and ‘Dreambox’ as Password to access the Dreambox. 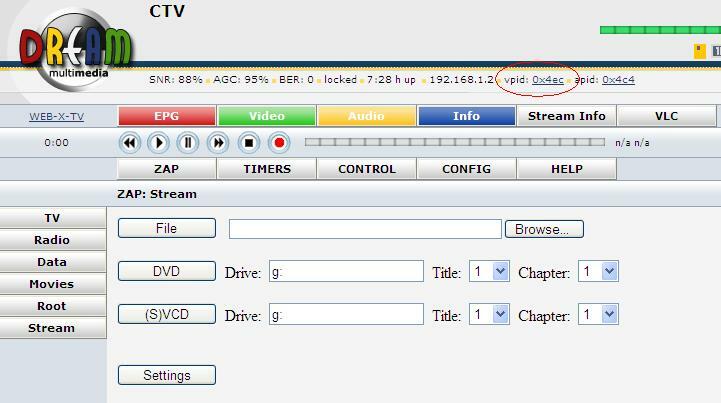 At the main page, look for vpid (as circled in RED) and click on the number on its right (ex: 0x4ec). Then, a pop up window will appear asking you if to open or save this file. Click Save (with the default name of “video.m3u”) to any of your local directory that you will need to locate it to open later. Once done, click on the file that you saved earlier (in step vi.) and it will launch the VLC player ready with the media contents to be streamed directly from your Dreambox decoder. Definitely, this looks much more impressive than when you try to capture or snapshot TV images on PC using Dreambox decoder since you can see smooth and live media contents streaming without lagging even wirelessly (but also depending on your network stability) on multiple PC with just few simple steps.